When we talk about health care, we almost never talk about teeth. But the state of your dental health can be a life-defining issue. Teeth have always been taken more seriously by the average citizen than by policymakers. Well-off parents will spend thousands of dollars ensuring their children have straight white teeth. Adults will spend just as much restoring worn teeth, or whitening stains from decay or coffee or cigarettes. It’s easy to see why, and the reason isn’t (or at least isn’t only) vanity. In popular culture, from Lucille Ball’s snaggletoothed characters to Deliverance’s hillbillies to stereotyped “meth-heads,” bad teeth are used to indicate stupidity, poverty, or villainy. Most Americans will do everything they can to avoid those stereotypes. Our government should start helping them. Why? What’s the crisis? It’s true that in the sweep of past decades, oral health in the United States has broadly improved, through education and the addition of fluoride to water and toothpaste. But that improvement has hidden real suffering, particularly in poor and rural areas. Numbers can’t relay pain, but some of them are shocking. Among Native Americans, children age two to five already have an average of four decayed teeth, compared to one for whites. (The money isn’t what’s important, but it’s worth noting, as the Indian Health Service does, that “[b]ecause of their young age, many children with decay must be treated in a hospital setting under general anesthesia at a cost exceeding $6,000 per child.”) Forty-three percent of Native American adults age 35 to 44 have untreated tooth decay and gum disease. More generally, around 27 percent of American adults age 20 to 64 have untreated decay, including 36 percent of Hispanics and 42 percent of African Americans. The 2007 case of Deamonte Driver, a 12-year-old boy from Maryland who died after bacteria from a tooth abscess reached his brain, showed the seriousness and necessity of preventative care. At the time, Driver’s family was dependent on Medicaid but was temporarily off the rolls, likely because a re-enrollment form was mailed to an old address. For those of us lucky enough to have had parents able to pay for the elaborate mix of braces and plates and retainers used to fix cosmetic problems, leaving a cavity unfilled, let alone enduring an outcome this tragic, is hard to imagine. While health matters most, the importance of those cosmetic improvements shouldn’t be understated either. Teeth are an important class marker and, for women in particular, have an effect on earnings. A clever National Bureau of Economic Research study found that controlling for other factors, women who grew up in areas with fluoridated water earned 4 percent more than those that did not, “suggesting consumer and employer discrimination are the likely driving factors.” Really, the simple dignity of having a healthy mouth is reason enough to provide every American access to dental care through a universal system for children and an Obamacare addition for adults. So how does dental coverage work now? Like the rest of American medical care, through an elaborate patchwork of out-of-pocket payments, employer insurance plans, and government assistance. State Medicaid programs are required to cover children, but not adults. Similarly, Obamacare requires health insurance plans to cover only children. Measuring the uninsured isn’t the best way to judge who has access, as some Americans have enough income to cover routine dental work out of pocket. But even accounting for some who might procrastinate or avoid dentists’ offices, the fact that 27 percent of Americans have untreated tooth decay suggests a large problem. Seventeen percent of Americans age two to 17 haven’t seen a dentist in the last year. It’s worth a brief detour to explain why dental care has been given such short shrift by the government and insurance companies. Despite its current sophistication, dentistry is relatively new as a specialized field. The first college devoted specifically to it opened in 1840, and throughout America’s early history, barbers were the ones pulling most of the teeth. But even after professionalization, doctors still viewed dentists with this past taint, and the two fields never merged. Because of this historical accident, we’re left with a strange, illogical system; after all, decayed teeth or inflamed gums are injured body parts, just like a broken leg or runny nose. Yet somehow, treating those ailments is seen as a separate and subordinate concern. The simple dignity of having a healthy mouth is reason enough to provide every American access to dental care. Obamacare is changing things rapidly, but many Americans still do not have dental insurance. For low-income Americans, Medicaid is spotty at best. Fourteen states offer nothing beyond emergency care, a particularly bizarre policy given that oral health should be mostly preventative. Because offering dental coverage for adults isn’t required by the federal government, four states—Alabama, Delaware, South Carolina, and Tennessee—offer no dental coverage of any kind to Medicaid recipients. But coverage isn’t the only problem. Access—actually having a dentist near you who is willing to take your insurance—is just as important. And while opinions differ on whether there’s a dentist shortage, there’s little disagreement that poor and rural areas are woefully underserved. Over 50,000 Kansans live more than 30 minutes from a dentist. Around two-thirds of dentists nationally won’t even accept Medicaid as a form of payment, and that’s the average. In Maryland, at the time of Deamonte Driver’s death, fewer than one in six dentists accepted it. It’s safe to say that millions of Americans have coverage in name only. There are a couple of different ways to open up access to those who are uninsured. The first would be to license “midlevel providers,” a role roughly akin to a physician’s assistant. These would be dental hygienists with additional training who (still under the supervision of a dentist) would be allowed to do cleanings, checkups, filling cavities, and other tasks that are important but not medically complex. Dentists often graduate with a great deal of debt and can’t pay it off with Medicaid’s scanty reimbursement rates. The idea of the midlevel provider, then, is to fill in the ranks with providers willing to serve these patients. Around 27 percent of adults have untreated decay, including 36 percent of Hispanics and 42 percent of African Americans. Kansas, mentioned above as having “dentist deserts,” has experimented with this kind of third option. The state issues “Extended Care Permits” (ECPs), which allow dental hygienists to operate in their own location, but with the somewhat onerous requirements of needing dentists to both sponsor their practice and monitor their activities. Even though these hygienists are meant to work in underserved areas, it’s a bit strange to require someone’s potential business competition to sponsor her. The program has been a mild success, but those 50,000 Kansans more than 30 minutes from dental care include those served by these ECPs. More loosening like this could be done without much risk. The pushback comes, of course, from the dentists themselves. While concerns about the professionalism of medical practitioners should always be taken seriously, it’s hard not to see the unrelenting opposition to any kind of independent dental providers as much else besides protecting the field from competition. The Obama Administration itself has begun to move, albeit slowly, on the broader issue of occupational licensing. A recent report on the trend prepared by the Treasury Department, Labor Department, and Council of Economic Advisers pointed out that there’s been little to no evidence that stricter licensing requirements improve quality of dental care and, in fact, “imposing greater licensing requirements on dental hygienists and assistants increases the average price of a dental visit by 7 to 11 percent.” None of this is to say that regulations aren’t necessary for a field that does intricate, medically delicate work. It’s to point out that the pendulum is far enough on one side that we can afford to let it swing back a little if that means many more Americans will get desperately needed treatment. If opening up the free market a bit is the answer to the access problem, then old-fashioned government payment should be the answer to the coverage problem. Norway provides free dental care to children up to 18, and that should be the model followed in the United States. Means-tested programs are sometimes a good idea, but with medical care it’s too easy for them to become underfunded and neglected. Given that the Affordable Care Act has already been fought for, implemented, and defended, it’s more realistic to implement adult dental coverage through the ACA, by making it part of the suite of services that insurance plans are required to include. President Obama reportedly seriously considered this, but relented to secure passage of the bill. His successor should take that cause back up. Right now, Obamacare requires plans, with some exceptions, to cover children’s dental care. This is a good first step, but a better one would be a simple single-payer dental system through age 18. There are two reasons for this. The first is the uniquely preventative nature of dental care, and the importance of getting teeth cared for at a young age. Dental sealants, a plastic coating that covers hard-to-brush grooves in teeth, reduce tooth decay in children by up to 80 percent and can last in teeth up to five years, for instance. And second, universality matters: The reimbursement rates for Medicaid versus Medicare—66 cents on the dollar for the same treatment—show how means-tested programs end up underfunded and unprioritized. Those patients have the same difficulty seeing primary care doctors that they do on the dental side. There’s an obvious point here, which is that children should have free medical care as well. Thirty-seven percent already do, via Medicaid and the Children’s Health Insurance Program. The best outcome is that dental coverage for children shows Americans that single-payer coverage isn’t a bogeyman. In the second of his embarrassing audio leaks, this one after losing the 2012 election, Mitt Romney told donors that he lost because President Obama had given his constituencies “free stuff.” Romney, forever aghast at the thought of government helping people, warned those on the call: “What I would do if I were a Democrat running four years from now, I’d say, you know what, dental care ought to be included in Obamacare.” This journal isn’t in the habit of passing along counsel from Mitt Romney, but this is advice progressives should follow. 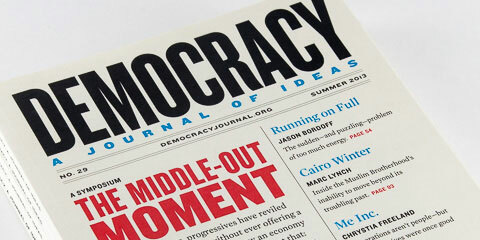 Jack Meserve is the managing editor of Democracy: A Journal of Ideas.